This split level, open plan, first floor apartment, retains many of its original period features. The wooden ceiling beams and chandeliers provides an exclusive and romantic atmosphere in the heart of Florence City centre. The apartment is the perfect base to explore the treasures of Florence City centre or explore the surrounding Tuscany countryside. The train station and bus station are very close. All the car rental firms are on this street so cars can be hired in the same street. The upper level comprises of the large bedroom and ensuite bathroom. (Bed size is 2m x 1.6m (6ft 6 inches x 5ft 2 inches). The lower level (two steps down) comprises of the living room / dining room with the kitchen set off. The air conditoning unit provides cool air in the summer and warm air in the winter. Double glazing has been installed to the windows. A new bed, mattress and washing machine has been installed. A new router allows free unlimited wifi internet access. The Ponte Vecchio and Uffizzi gallery is less than ten minutes walk, along the river Arno. Borgo Ognissanti is a one way street that has lots of speciality shops that makes it easy and convenient to buy groceries, fresh bread and milk. The street boasts several local supermarkets that have good quality fresh produce, fishmongers, speciality meats, wines, bakery and some excellent restaurants. In addition to fine art and furniture shops. There are car hire shops in the street and a garage for private parking. Parking is not included in the price.The www.garageeuropafirenze.it/en is in the same street and costs from 25 Euros a night depending on car size. Not included in price. Car rentals firms are in same street and store cars there. St Regis Hotel and the Westin Excelsior Hotels are nearby in Piazza D'Ognissanti (3 minutes walk, 220 metres as stated on googlemaps) which are arguably the two finest hotels in Florence and giving you confidence that the location is excellent for visiting the sites. You have the location without the price of these hotels and even more space than a hotel room. The police station (Carabinieri) is also in Borgo Ognissanti which provides a sense of safety and security to the area. We accept payments in Euros contact us to learn how to pay in Euros. english, We accept Paypal, transferwise and bank transfers. We have provided additional information that we think will be useful to your stay on https://www.facebook.com/florenceapartment and www.florenceapartments.co.uk The apartment is in a 17th Century building and is owned by William’s family whose ancestors owned the English Pharmacy (Farmacia Inglese) on one of the main streets of Florence, via de’ Tornabuoni. William’s grandparents left before the war and moved to England where they then set up many similar pharmacies in the City of London. You can still see the Farmacia on via de’ Tornabuoni which has now been turned into a shoe shop, but all the original wooden display cabinets for the medicines and tinctures are still there. We hope you will enjoy discovering this beautiful historic City and visit again. We also accept payment in Euros. This property is in the historical City centre close to the train and bus stations and has good local shops but also a short walk to the main tourist attractions. The river Arno is also very close by that provides wonderful views. The Westin Excelsior and St Regis hotels are nearby arguably the two best hotels in Florence. The Police station is in the same street that adds to the sense of security. The apartment with its period features provides a link with the past. Central location allows you to walk to all the tourist sites. Speciality shops in the same street provides great food and fabulous restaurants. Car hire available in the same street with Hertz, Avis etc. Free unlimited WiFi. On first floor so only one flight of steps. Air conditioning, double glazing & washing machine. A clothes rack / airer is in the apartment to dry clothes. The kettle goes on the gas hob. Water can also be heated in the microwave. Due to the old historic nature of the building when constructed it provides a true Florentine experience as a local. Baby sitting available on request and by prior agreement. Cot and baby feeding seat present in apartment. The free wifi allows access to the internet for tablets and phones. Carbon monoxide alarm and smoke detector installed in the apartment. There is a car park in the same street as the apartment. Parking is not included in the price. We enjoyed our stay. Precipitous stairs on entry. Fairly basic kitchen facilities in apartment and nowhere to prepare food. A chopping board would be really useful! Local supermarket and shops excellent. Il profeta restaurant wonderful but expensive. Useful bus service to more or less everywhere. Close to train station, Uffizi, Mercato Market, grocery store (Conad)and lots of restaurants. Great coffee shop across street (Bianca). LaPizzera across street was casual, inexpensive and very good food (especially the eggplant parm). Apartment was clean and fully equipped. It was good to have a washer, although it operates quite differently than I am accustomed. Took a while to figure out. Dryer is a drying rack. Dear Sue, thank you for the review of the apartment and wonderful to hear that you found the location great in terms of close proximity to the train station, Uffizi Gallery, Mercato Centrale, supermarket & restaurants. You found the apartment clean & fully equipped. kind regards William. My boyfriend and I had a wonderful holiday in Florence and we owe this in part to the amazing apartment we stayed in! 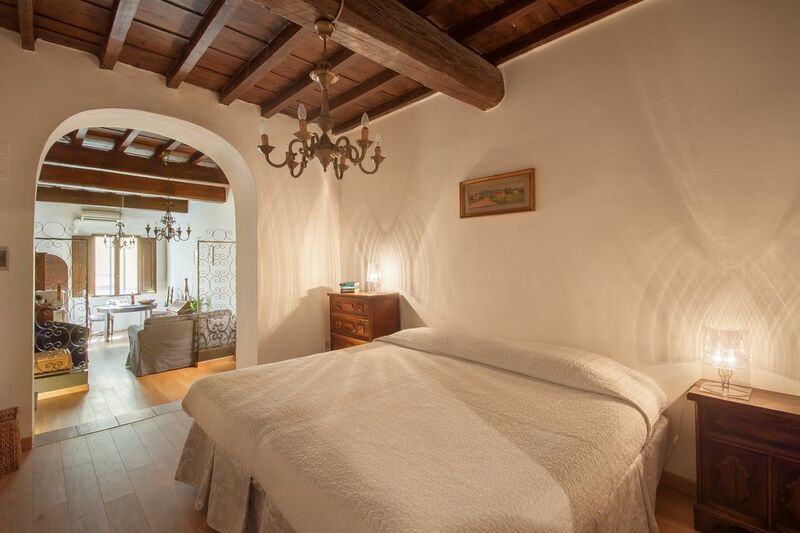 The Borgo Ognissanti apartment is centrally located, above a brilliant bakery, comfortable, clean and perfect for a couple looking for somewhere to stay in Florence. We were able to get to some of the big attractions eg the Uffizi gallery within 10 minutes! The hosts also provided a list of recommended restaurants - one of which we tried out and it was simply divine. Best steak of our lives! All in all, this apartment and Florence are amazing!! Couldn’t recommend more! Thank you for an amazing holiday! Charming, lived like a local feeling. Great way to experience life in Florence. Incredible location. thank you for the fantastic review and wonderful to hear that you found the apartment charming, the location incredible and had a great experience of life in Florence living as a local. Kind regards William. We enjoyed our stay at Santa Maria Novella. The bed was very comfortable and with the shutters closed it was very dark, which made for great sleeping. The location is convenient to the bus and train station and we used this as our starting point to tour other cities. Beatrice was very kind and helpful. We would stay there again. Dear Mary, thank you for your excellent review and great to hear that you enjoyed your stay, found the bed very comfortable and had great sleep. The location convenient for the bus and train stations and Beatrice very kind and helpful. We look forward to seeing you again. kind regards William. This apartment was perfect for our family. It slept 2 adults and 2 teenagers comfortably. It is close to restaurants, markets, bakeries, shopping and points of interest. Beatrice who checked us in was so nice and helpful. The only downside is there are steep steps to get to the apartment so those with mobility problems should be aware. FYI- there is a Michelin rated restaurant across the street. The pastry shop right below the apartment has the most delicious goodies and the price was great. It was less expensive to run down every morning than buy groceries and prepare breakfast. The apartment is on Borgo Ognissanti which is a couple of minutes from the River Arno and close to the famous Grand and Excelsior Hotels at Piazza Ognissanti. It is directly above a bakery which is convenient for buying fresh brioche in the mornings. Opposite is the highly recommended Il Profeta restaurant, which has fantastic food. Santa Maria Novella train station is approximately five minutes walk from the apartment. We will send you a map showing the apartment location in the Centre of Florence when a rental inquiry is made. There is a secure private car park available in the same street one minute from the apartment. Parking is not included in the price. You can walk along the Arno to visit the Ponte Vecchio (the old bridge), Uffizi gallery, Piazza della Signoria and on to the Duomo and Giotto's Tower. Alternatively cross over the ponte vecchio to visit the Pitti Palace and Boboli Gardens in the Oltrano district. Other Activities: Within easy walking distance of all the major tourist attractions. If you are arriving by car there is a secure private car park in the same street. Parking is not included in the price.